THR has broke news that Disney has decided to reboot, update, remake the 1986 SciFi adventure "Flight of the Navigator" which followed a young boy who is abducted by a spaceship to return 8 years later unaged and with no knowledge of his depature. Wild Hogs writer Brad Copeland will pen the new script for Disney which is being produced by David Hoberman and Todd Lieberman. While this news break could upset the masses like other recent remakes i.e. The Karate Kid, Romancing the Stone and Footloose, but honestly "Flight of the Navigator" seems ripe for an update. The current technology could surely vamp up some of the scenes that today, seem completely out-dated. The original film only made $17 million at the box office, however went on to cult status on VHS. I use to religiously watch this film, but for some reason, an update seems logical. Granted the original was purely targeted at kids and there's no doubt the update will be as well. Hopefully, for Disney's sake, the remake can go on to large success at the box office for a whole new generation to enjoy. I'd show the original to my own children, if I hadn't watched the film so many times that the old VHS tape broke (that was a sad day in the Schofizzy household, at least from my perspective). 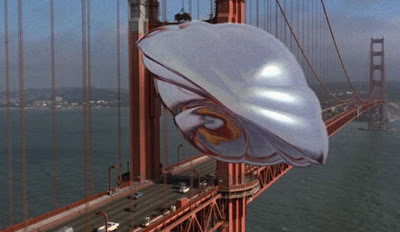 So bring on "Flight of the Navigator" remake, i'll be bringing the whole family and hoping for the best!